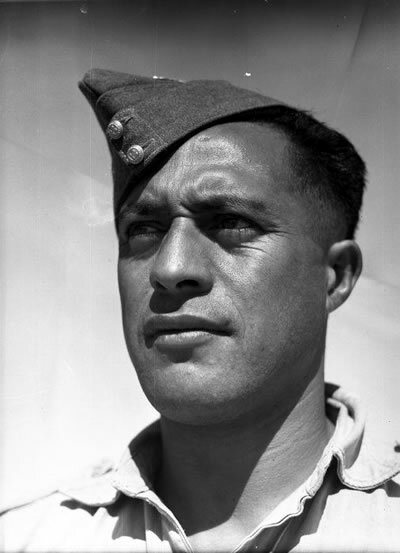 During the Battle of Takrouna in April 1943, Sergeant Haane Manahi of Te Arawa led a small band of Māori Battalion soldiers up a 200-metre-high rocky outcrop. Despite intense mortar and machine-gun fire, they helped capture an enemy stronghold held by more than 300 Italian and German troops. The act was described by Lieutenant-General Sir Brian Horrocks as ‘the most gallant feat of arms I witnessed in the course of the war’. Although a field marshal and three generals recommended Manahi for the Victoria Cross (VC), this recommendation was changed, and a Distinguished Conduct Medal (DCM) was awarded instead. Manahi died in a car crash in 1986. In late 2005 Te Arawa and the Returned and Services' Association sought the Waitangi Tribunal’s support for moves to award Manahi the VC. Te Arawa argued that their requests to uphold the original VC recommendation had not been handled adequately by the New Zealand government, constituting a breach of the principles of the Treaty of Waitangi. In 2006 a bid to have the VC awarded posthumously was taken to Buckingham Palace by the Minister of Defence, Phil Goff. After careful consideration, the request was turned down by the Queen, who followed King George’s 1949 decision that no further awards from the Second World War should be considered. In October 2006 it was announced that Buckingham Palace had agreed to honour Haane Manahi in a different form. The Duke of York, representing the Queen, presented an award to representatives of Te Arawa and the Manahi family at a ceremony at Te Papiouru Marae, Ohinemutu, on 17 March 2007. After consultation with the Manahi VC Committee and Te Arawa, it was decided that the award should be inspired by the famous line, 'For God! For King! And for Country!' from the marching song of the 28th Māori Battalion. ‘For God’ was marked by the presentation of an altar cloth for Saint Faith’s Church, near Manahi’s burial place. A letter from the Queen, acknowledging Manahi’s bravery represented ‘For King', and a sword presented to Te Arawa by the Queen acknowledged ‘For Country’. Te Arawa presented the sword to the Chief of Defence Force (CDF), Lieutenant General Jerry Mateparae, along with a patu in memory of Haane Manahi. The sword will be displayed in the office of the CDF, while the patu will be worn, on appropriate occasions, as part of the dress of the CDF. These gifts represent a tangible link between Haane Manahi, the Queen, Te Arawa and all serving members of the New Zealand Defence Force.